Janet Wahl, PhD, CHt, is a certified provider of hypnosis and ThetaHealing® Master, she integrates ThetaHealing techniques with dream work. 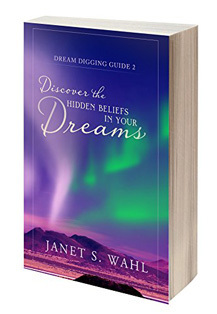 Her Dream Digging Guides give the reader step-by-step processes for discovering the messages and hidden beliefs in their dreams. 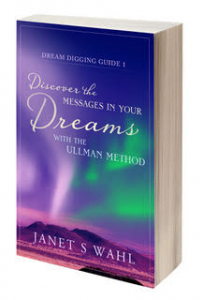 Dream Digging Guide 1, Discover the Messages in Your Dreams with the Ullman Method describes the dream group process developed by Montague Ullman, MD. For 15 years during her 35-year career as a teacher, administrator, and professor, she participated in Montague Ullman’s dream groups and took his leadership training workshops. Dream Digging Guide 2: Discover the Hidden Beliefs in Your Dreams explains how dream images and metaphors carry our subconscious beliefs. We are unaware of most of these beliefs especially those that block our success. Further, our conscious waking mind usually does not want to acknowledge these beliefs. That’s why dreams vaporize when we awaken. If dreamers identify these hidden obstructing beliefs, they can be changed. The next book, Dream Digging Guide 3 will describe how beliefs can be changed. ThetaHealers® will find this particularly helpful in their digging work for themselves and for clients. She currently sees clients and teaches courses in dream work and ThetaHealing. You can find out more about her work at www.dreamdigging.net and www.mindbalance.biz. Why did I have that bizarre dream? What does it mean? Dreams have provided many benefits: solutions to problems, inspiration for works of art, and warnings of physical disease before medical doctors diagnosed it. An Ullman dream group helped the author decode a dream that propelled her to retire sooner than later. Dream Digging Guide 1 describes this process invented by Montague Ullman, a neuropsychiatrist and dream researcher. Frustrated with psychoanalysis, he formed dream groups that follow structured steps to help the dreamer decide what her dream means. Only the dreamer knows. That’s why dream dictionaries don’t work. But groups can offer ideas for her consideration—more ideas than the dreamer can imagine. This structured process ensures dreamer safety: the dreamer decides how much to share and can stop the process any time. Learn this method that has unearthed many messages to help dreamers heal physically, emotionally, and spiritually. Do you believe you deserve a successful career? A harmonious relationship? Prosperity? Your conscious mind says “Yes.” But your subconscious mind might say “No,” and it always wins. If your subconscious mind says “No,” it may believe that “prosperity is dangerous,” or “someone will rob and kill you for your success,” or “a relationship will destroy you.” The reason is specific to you. So how do you forge an agreement between your two minds to create what you want? Your dream images can help. Yes, those bizarre images are communicating your personal beliefs that block success. Learn to find and test those beliefs hidden in your dreams. This simple technique is a powerful tool for everyone, from curious dreamers to experienced ThetaHealers® who wish to improve digging skills for themselves and their clients.